People around me who have seen me only in kimono often come to me and asked these questions these days. In fact I had been a mere staff of a company through and through, leaving home early in the morning and come home late at night until the spring of the year of 2000. I was so immersed in the life making successful business plans and taking care of my boss's next day's business schedule. I couldn't have thought think of changing my day to day life in suites and high heeled shoes. I'd be most honored if you would read this booklet and know that I, having gone through such a past life, went on the steps as “Okami of a Kimono Dealer somehow or another with the struggle in a mess in the Kimono Industry. 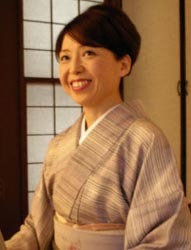 In my twentieth, I had just a little bit of knowledge of ‘Flower arrangement', �ETea ceremony', and �EDressing kimono' not knowing even names of a bustle of ‘Obi' and a �Ebundle of ‘Obi'. I couldn't have mentioned it before as I may have had a hesitation to expose it to public. I quite working as an OL at the end of March 2000 and began my new carrier as a net-shop dealer in Sept. at the age of 45. I hope you may get something out of this booklet of my tracks till the time of the birth of ‘Okami' of a net-shop.